In Paraguay, the #somosobservadores campaign is moving forward with its campaign to bring attention to the victims of the Curuguaty massacre, a violent attack on farmworkers by special operations police forces that occurred three years ago in June of 2012. The #somosobservadores campaign, organized by community organizations and social movements in Paraguay, is moving forward with its campaign to bring attention to the victims of the Curuguaty massacre, a violent attack on farmworkers by special operations police forces that occurred three years ago. The massacre took place on June 15, 2012, when more than 300 special operations police officers within the Grupo Especial de Operaciones (GEO) attempted to forcibly displace 60 campesinos (farmworkers or peasants) who were occupying a highly contested piece of land. Long-distance shots were fired and a battle ensued leaving 11 campesinos and six officers dead. This moment, which shocked the country with violence unheard of since Paraguay’s military dictatorship ended in 1989, was used by the Congress of Paraguay as a primary excuse to impeach center-left president Fernando Lugo. Three years later, 13 of the campesinos are on trial facing criminal charges. However, the #somosobservadores campaign has highlighted the fact that as of this date no police officers or officials have been investigated for the killings of the 11 campesinos. According to Coordinator of Human Rights in Paraguay, a nongovernmental organization based in the capital of Asunción, there has been a systematic level of impunity for those who have committed arbitrary executions and forced disappearances against those who struggle for land and land reform. The organization sent a report to the Inter-American Commission on Human Rights denouncing the 115 cases of extrajudicial killings and forced disappearances of social movement and peasant leaders, the continued impunity over these cases, and the increased levels of violence and threats to those involved in social movements. 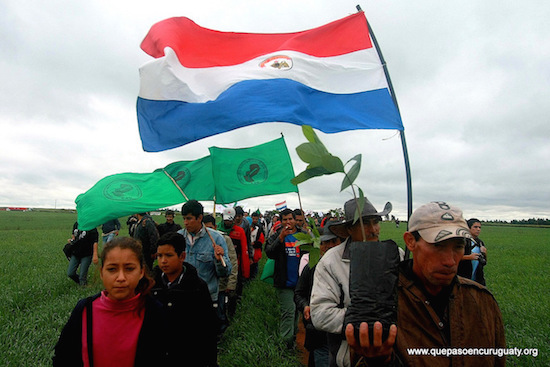 While not directly linked to these cases, the United States Agency for International Development (USAID) has played an influential role in advising Paraguayan government institutions and facilitating a military presence in areas where social movements and conflicts over land have been growing. 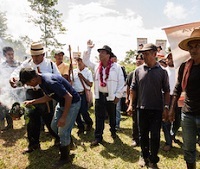 Nestor Castro is one of 13 campesinos currently on trial, facing criminal charges for the events that unfolded in 2012 when elite police officers descended on Curuguaty to violently evict the campesinos who were occupying nearly 5,000 acres of contested land. Police testimonies from the scene state that the campesinos attempted to ambush the elite police unit, which forced, then fired back. However, the fact that official testimonies were only gathered from police – as many of the campesinos were injured and in the hospital, or were in hiding for fear of further persecution – speaks to the level of impunity that officials like the police have. To this day no officer nor any of those who where the intellectual and moral authors of the Curuguaty massacre have been held accountable. The case is full of what the defendants call “irregularities,” raising multiple red flags for observers and independent analysts, and raising many questions about the validity of the charges against the campesinos. As he continued, Nestor explained the multiple, painful ways in which the massacre impacted his life. His entire family was involved in the struggle for land. One of his brothers died in the massacre; the other was injured. Additionally, “10 other of my compañeros were killed,” he said. “To have land is fundamental; from land comes our nutrition … we would be able to build a house, raise our family,” Castro explained. These are the reasons he and many others continue to fight for a piece of land. All 13 campesinos uphold their innocence and are fighting to clarify the irregularities and contradictions that have emerged throughout the multiple independent investigations and reports. Some are accused of “voluntary attempted homicide” – despite the fact that, according to the defense, there is no evidence of the campesinos having fired a gun. It is this type of systemic injustice that has been normalized throughout the country of Paraguay, specifically when dealing with members of social movements and campesinos that are determined to fight for land of their own. Critics of USAID argue that the Northern Zone Initiative programs avoid critical issues about land ownership. “This has massive collateral effects,” Coronel said. One such effect is the continued and increased presence of military and police forces throughout the rural regions, specifically the regions that are known for the strength of social movement organizations. For years, military and police personnel in Paraguay have received training from the United States, and according to a report from El Espectador, Paraguayan soldiers have been known to participate in special operations trainings from the Colombian military on how to respond to guerrilla groups. Plan Colombia, a US military and diplomatic initiative aimed at fighting drug cartels and guerrilla groups, has been used as a model for the type of influence the United States would like to have in the region, and has increasingly dedicated similar resources to countries such as Paraguay as a way to guarantee its own economic and political interests. She concludes by saying that what happened in Curuguaty is the “clearest example of … the criminalization and the perversity of justice.” It is also a clear example of how the institutions have been rigged in favor of large agribusiness. What is the role of the United States in this turmoil, and how has USAID contributed to the imbalance of power in the region? While there is no evidence to show that the US played a direct role in President Lugo’s impeachment or the events that unfolded on the ground, several USAID programs have contributed to the maintaining and furthering of the imbalance of power in the region. While USAID efforts are specifically “humanitarian,” geared toward “economic development” and the strengthening of “democratic institutions,” time and again reports and analysis have shown that their interests are twofold. In Venezuela, classified cables released by WikiLeaks showed that USAID played a central role in the coup d’état against President Hugo Chávez. In Bolivia, they supported political parties that attempted to challenge President Evo Morales and destabilize his administration. USAID has been known to be an “organization that while providing aid is also developing ways to undermine governments.” While each country in Latin America has had a distinct relationship with USAID, its efforts have been consistently to advance US political, economic and military interests – oftentimes under the guise of humanitarian support. The Threshold Program was designed by the Paraguayan government as part of a campaign against corruption and to strengthen the “rule of law.” However, as the report continues, administrative control over the funds for the Threshold Program in Paraguay “will be under the responsibility of the USAID,” which gives the United States direct influence over the many institutions that are funded through the program. This includes the public ministry (which gathered the police testimony in the Curuguaty case), judicial powers (which are currently administering the Curuguaty case), the farm ministry (which manages issues related to land conflicts), ministry of industry and commerce, interior ministry and the national police. These are the institutions that are heavily influenced by USAID and increasing US influence. The Northern Zone Initiative is funded by USAID and is largely intended to provide a legal basis for US presence under the guise of providing medical equipment, personnel, guidance and technical assistance to local police forces and military personnel. One of the key organizations involved is based in Washington, DC: the Agricultural Cooperative Development International and Volunteers in Overseas Cooperative Assistance. Its stated mission is to promote “economic opportunities” and “positive social change” in places that have high levels of conflict and violence. Its programs are designed to create a presence in areas where the state is considered relatively absent. Its stated goals include creating “stability” through educational, health and environmental programs, and through strengthening local governmental democracy. The Northern Zone Initiative programs have been underway for decades, though their funding has been increased dramatically in recent years. However, critics of USAID argue that the Northern Zone Initiative programs attempt to provide “humanitarian support,” yet avoid critical issues about land ownership. These programs not only dismiss the fundamental demands around land reform and land acquisition made by the country’s social movements, but they also create a dynamic where “security” signifies an increase in military forces, as opposed to actual safety for the region’s residents. 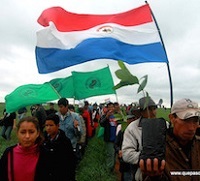 While struggles around land and land reform continue to be the top issue for social movements and campesino movements, the current government in Paraguay is working to maintain the existing levels of land concentration and inequality. Armando Carmona is a freelance journalist and an editor at upsidedownworld.org.